Five for Friday – It Works For Bobbi! Published on September 14, 2007 August 9, 2016 by Bobbi-Jo G.
1. I love my mother-in-law. Really. As a mother figure, and simply as a person, I love her! You know if I were to sit down with a pen and paper and describe the ideal mother-in-law, I couldn’t have imagined a better fit for me than my mother-in-law. She invited me out for lunch today, which was a surprise, and a welcome one! I’ve always found her very easy to talk to, very genuine, and a great resource for helpful hints and advice (yes, I actually value my mother-in-law’s opinion). She works hard – in every way, and I respect her so much for that. She values her relationship with her grandkids, which is so nice because I know how different it could be with me being the daughter-in-law – there could be just a different dynamic with my kids then say, her daughter’s children, but with her it’s no different. I hear all of the mother-in-law horror stories out there and I just sit back and smile because I have been so blessed! I have to say that I love my father-in-law just a much, and of course, my own parents as well! How blessed am I to have 4 parents who love me and bless my life every day? 2. I hate moving. Really. I hate it. Okay, maybe hate is a strong word (my mom would have me say “I don’t CARE for it…), but seriously – if I could afford it, I’d leave everything to the last day, hire professional movers, and relax in a hotel while all the work is done for me! What I dislike the most is having to keep the house spotless day in and day out in case someone decides (last minute, mind you) to pop in for a showing! I mean, those people scrutinize your place like they were investing in a luxury hotel! Come on, folks – a family lives here. A family with 4 kids under the age of 7. By the way – is there any other time you could be free to come by (last minute, mind you) then right during the dinner hour? Sheesh! 3. JJ is growing up. Really. We were at the park the other night (yep – during a showing) and I was watching her, in awe of her sheer will and determination. She wanted to keep up with her big sisters and wasn’t willing to accept her limitations. 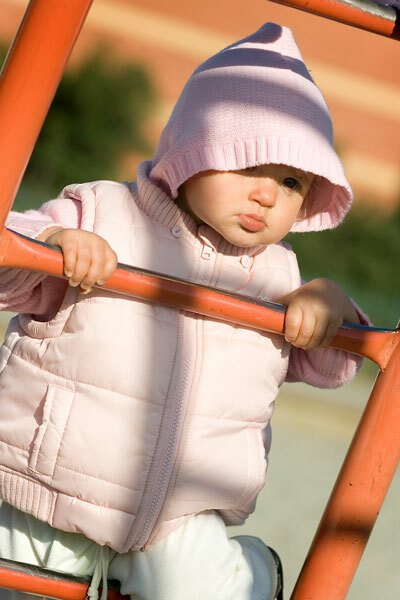 Her sisters were climbing on a peice of playground equipment and she started right up after them. She would slip down a step or two, maybe bonk her head once or twice, and cry for a minute or two (at the most). But she never once gave up, never said to herself “Well, I tried but it was too hard. I think I’ll go sit in the stroller”. She just kept going with a positive attitude. I admit that I can learn a lesson or two from my 1 year old. It’s amzing how much there is to be learned by just being an observant mother. Our children are born so pure, and it’s often our own examples that lead them to fear, hate, and discouragement. 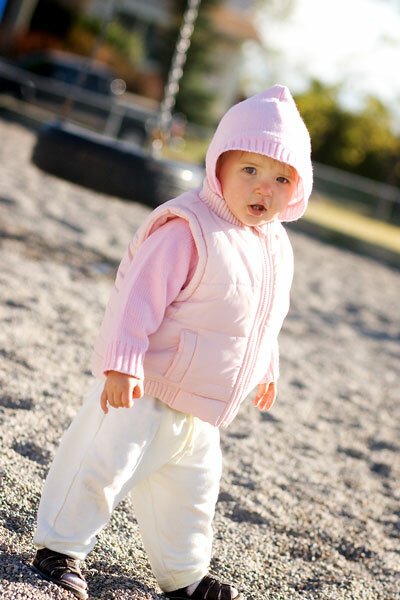 I understand why the Lord asks us to become as little children – humble, meek, teachable, and with the “I can” attitude. There is so much the Lord could do with us if we were a little more “moldable”. Thanks for the lesson, Jayda! So, you heat up the Olive oil in a large frying pan over medium heat. Add the onion and garlic and cook until tender (like 2 minutes). Add the rice, breaking up the clumps. Stir until the oil coats the rice. Add in the artichoke hearts, peas, lemon juice, vegetable stock, oregano, and salt/pepper. Stir until mixed well and heat through. When you are ready to serve, mix in the olives and garnish with the Feta Cheese. Stick a pita triangle tip down into the rice, and serve! So yummy! 5. My friend, Michelle, surprised me today with a little packet of cards and envelopes to say thank you for lending her our portable DVD players for their camping trip a couple of weeks ago. This girl is not only creative, but soooo thoughtful! 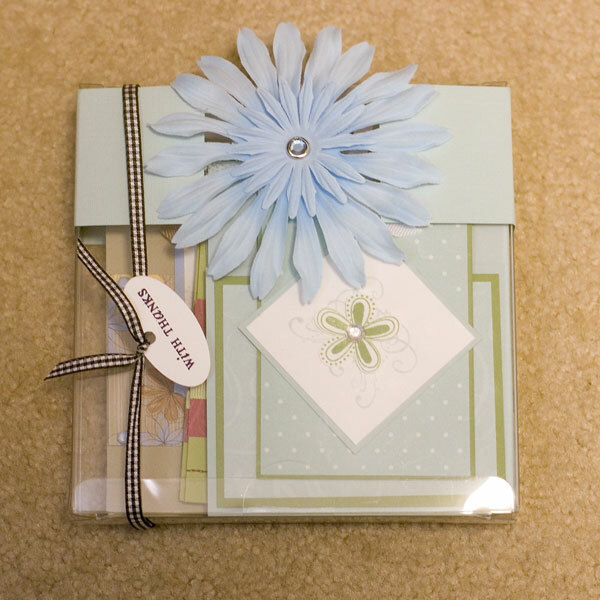 I was wanting some cards that I could have on hand for those little “thank you’s” that come up, and birthdays etc. This was just what I needed! And could she have packeged them any cuter? Seriously, girl you ROCK!!! Thanks so much! By the way – click on her name above to check out the fun little halloween treat bags she’s making for her kids’ school classes. She’s awesome! So there you have – boy even five was tougher than I thought. Well, I’m off to be more exciting so next Friday won’t be so hard! C ya! Thanks!Yummy! I will be trying that recipe.